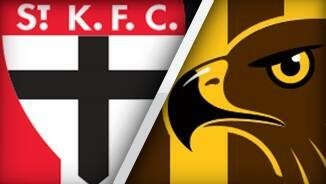 St Kilda scored 5.3.33 to Hawthorn 2.3.15 from defensive half intercepts. 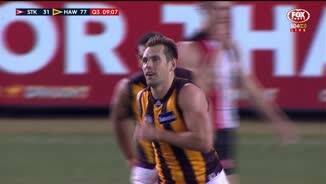 The Hawks scored 4.2.26 to St Kilda 0.1.1. from forward 50 intercepts. Leigh Montagna with 28 disposals at 96 per cent efficiency for the Saints, and the only player with more than 10 kicks and 100 per cent kicking efficiency. Hawthorn led the uncontested marks in the second half 5453 after the Saints were able to restrict this in the first half. St Kilda outscored Hawthorn from turnovers 9.5.59 to 8.7.55, but were beaten by nine goals from stoppages. Sam Mitchell with a game high 19 handball receives to go with a game high 8 clearances. Jack Steven now with a season high 38 disposals and Webster a career high 24 for the Saints. Jarryd Roughead with three goals, three score assists (both game highs) to go with 11 contested possessions (the second most on the ground). 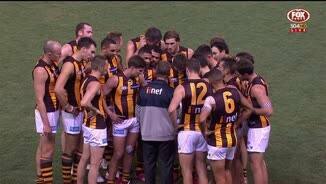 Hawks now lead 10.4.64 to 1.4.10 in scores from stoppages, with 5.0.30 from centre bounce clearances. Cyril Rioli has a game high six hard ball gets, which is the most he has had a in a game since 2012. 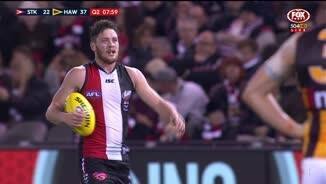 St Kilda InterchangeAdam Schneider replaces Luke Delaney due to the blood rule. Saints InterchangeLuke Delaney off due to the blood rule. Jack Steven with 607 metres gained. The next best Saint has 257 metres gained. 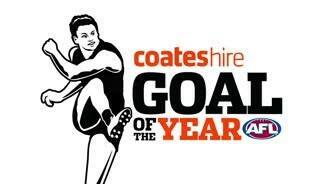 Hawthorn has scored 5.4.34 from forward 50 intercepts and stoppages. St Kilda has scored 0.1.1 from the same source. Sam Mitchell up to 11 score involvements, 13 contested possessions and seven clearances, which are all game highs, but with kicking efficiency of 45 per cent. 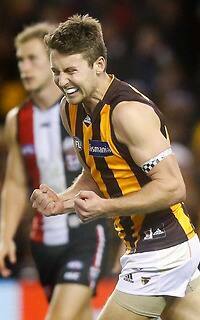 Hawthorn has scored 39 points per game from stoppages this season, and has scored 8.4.52 already today. Jimmy Webster with 20 disposals, nearing a career high 22. 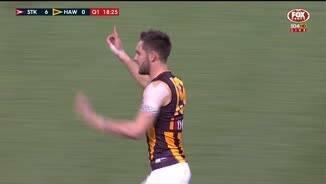 Hawthorn has nine of the first ten clearances this quarter and has scored 3.1.19 from this source. The Hawks now have six free kicks inside their forward 50, and seven of the last eight goals. Welcome to Etihad Stadium for the St Kilda v Hawthorn Round 10 clash. HAWTHORN has recorded successive wins for the first time this season with a 63-point triumph over St Kilda at Etihad Stadium on Sunday. The 20.12 (132) to 10.9 (69) win was the Hawks' fifth consecutive victory over the Saints. The Hawks now head into their bye with a win-loss record of 6-4, three wins behind leaders Fremantle, while the Saints are 3-7. Sam Mitchell was prolific for the Hawks off half-back. The veteran had 18 touches by half-time and finished the game with 35 disposals, a game-high eight clearances and five inside 50s. Speedster Billy Hartung broke the lines and a gathered a handy 26 disposals, while skipper Luke Hodge had 25 possessions and kicked two goals. The Hawks had 12 individual goalkickers with Jarryd Roughead and Jack Gunston booting three apiece as they claimed another Blue Ribbon Cup. In his 100th game, Saints midfielder Jack Steven was outstanding. The 25-year-old finished with a game-high 38 disposals, seven clearances and five inside 50s and was presented with the Silk-Miller Medal for best on ground after the game. Steven was well assisted in the midfield by veteran Leigh Montagna, while defenders Dylan Roberton and Jimmy Webster were also solid contributors. 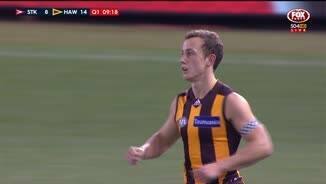 Former Hawk Shane Savage started as the substitute, but came on seven minutes into the third term and had an immediate impact kicking two goals. The final scoreline wasn't a true representation of the competitiveness of the Saints, who battled hard for three quarters, but were ultimately outclassed by the reigning premiers. The Saints tried to control the tempo of the game by playing a possession game. They finished with 32 more uncontested marks and 50 more disposals but lacked the polish of the Hawks. 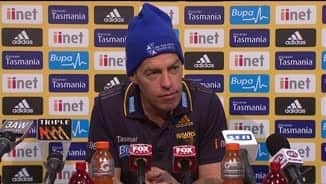 Hawthorn coach Alastair Clarkson described the game as "strange" and said he wasn't entirely happy with the performance. "There were parts of the game we were obviously pleased with and that's obviously the margin at the end and the fact we won all four quarters," he said. "They had a little too much ball control for our liking. They had a lot of uncontested marks. Whilst they couldn't convert those into inside 50s as well as they would have liked, it just meant we couldn't get the game on our terms as much as we would have liked. But we still scored really well and were able to restrict them to a pretty (low) score. "They got some junk time goals at the end, so for the bulk of the game to keep that side to seven goals was a pretty good effort." The Hawks had 11 more clearances than the Saints for the game, and were able to score 10 times from stoppages. 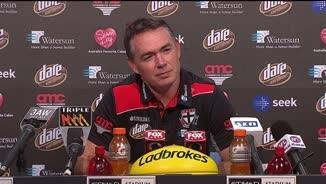 "That was a struggle for us all night," St Kilda coach Alan Richardson said. "We scored 1.4 from clearances and they scored 10. You got to take into account though, they just don't win clearances, run and midfielders kick goals, you still have the opportunity to defend that. "There were periods where we were really strong in our one-on-one match ups but there were five-minute periods in most of the quarters where they just got hold of us." The Hawks led from start to finish but were far from their best in the opening half. They dominated the clearances (20-16), contested possession (73-58) and had seven more inside 50s but were wasteful with their disposal by foot and inaccurate in front of goal. Hawthorn kicked 4.5 in the opening term, and the second quarter started in the same fashion with Gunston and Roughead missing set shots and keeping the Saints within reach. But St Kilda's turnovers proved costly just before half-time with Webster hitting Luke Breust on the chest from a kick-in following a point. Bruest converted, sparking a burst of three goals in three minutes late in the second term to give the Hawks a 35-point lead at the main break. Clearly unhappy with his team's first half performance, Clarkson addressed his players on the ground for several minutes at half-time before taking them down into the rooms. The match opened up in the third term as the Saints struggled to win the ball out of the centre, while the Hawks took their game to another level. Their more experienced players asserted their dominance in the middle, and it paid dividends with the premiers piling on six goals to four. The game blew out in the final term with the Hawks kicking six consecutive goals before the Saints finished off the game with three late goals. Official crowd: 33,886 at Etihad Stadium.